Transit advertisements offer huge advantages within the marketing arena. First off: Exposure. Advertisements on busses and trains are 8x more likely to be viewed as compared any other print medium. Secondly: Frequency. Riders are more than likely to see the same ad numerous amounts of times, which ultimately leads to numerous impressions. The more a viewer is attracted to its message, the more likely they are willing to inquire. Thirdly: Cheap. If you are a constant calculator of ROIs and percentages, this is the one case where you should have no fear. It has been proven that investing in promotional pieces for public transit yields numerous amounts of benefits. Just be certain that your campaign is simple, easy to interpret and visually attractive. 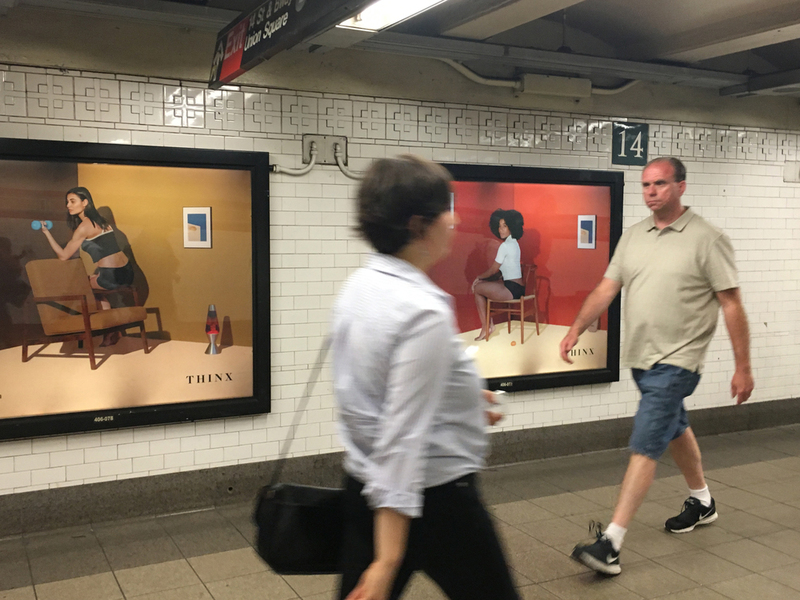 I've viewed some of the most creative, engaging, humorous and informative ads during my morning commutes in New York City, and have decided to share them with you on a scattered basis. The ads below were spotted throughout trains, busses and public spaces. 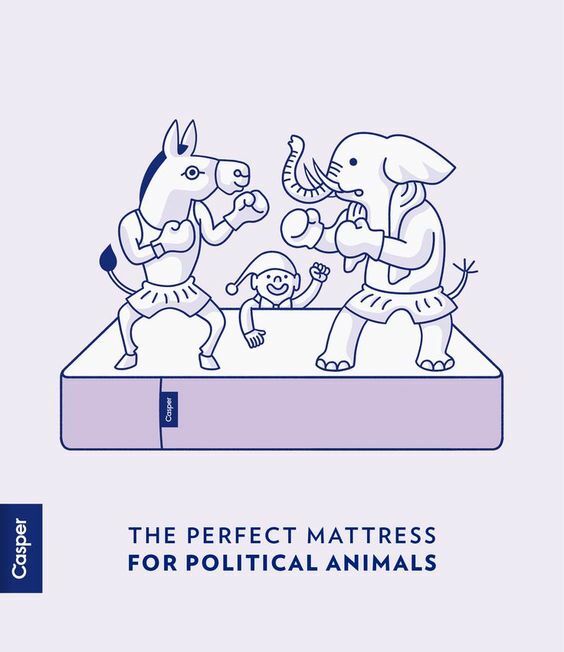 Casper - Mattress Retail. One of the reasons I gravitated to this campaign is because of the humor and subliminal messages throughout. I love the subtly of their color palette and appreciated the illustrative approach. It's quite clear the creatives at casper did their research. After all, New Yorkers are oversaturated with photographic, dark, over emphasized ads, its a breath of fresh air to see something different. Loving the adult humor here Casper. 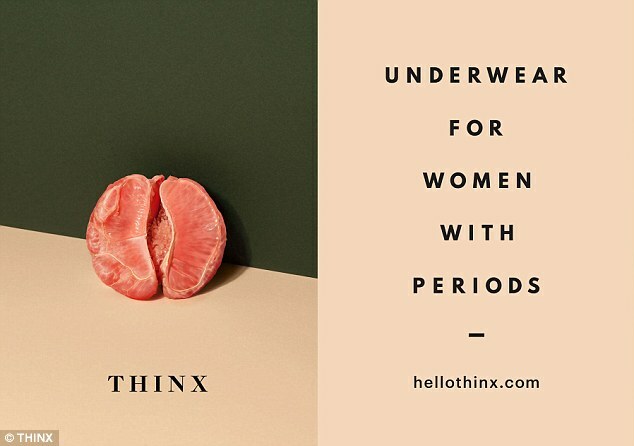 Thinx - Menstrual Underwear. 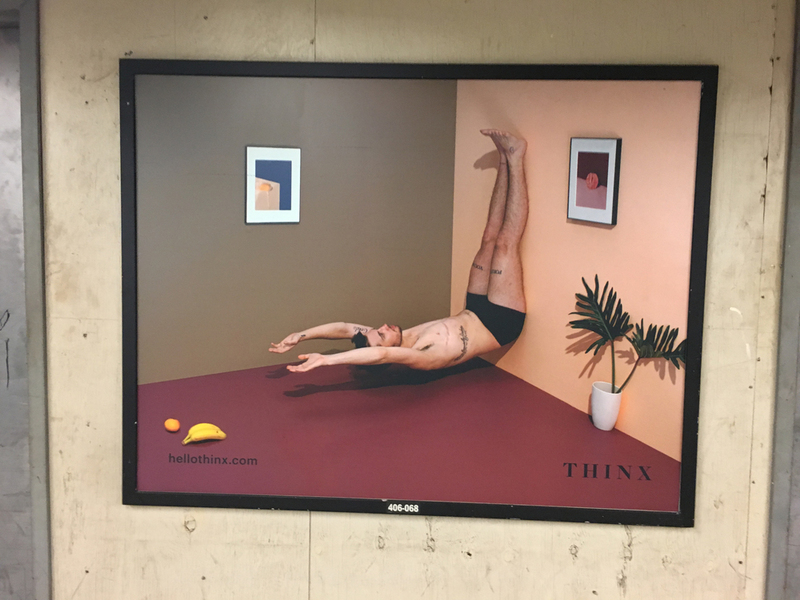 I instantly gravitated to Thinx's extremely expressive campaign. Not only could I personally relate, but I found there approach it to be quite clever,: the releasing of the egg... a blood orange... an egg drooping off the edge of a table. These all depict what happens to a female internally when their monthly visit arrives. Brilliant! I absolutely loved the approach of their first campaign. Thinx then came back for some more when they released their second series, even conceptually stronger than the first. The ads maintained that element of discomfort during a females cycle, however, they also addressed societal issues of today's race (the human race). If you scroll through the images below, you'd notice a masculine individual in an uncomfortable position. That however, is not a male... that is a transgressed female. Yes, I too in ignorance took awhile to grasp. Brilliant! They also cleverly camouflaged their first series ads as picture frames. Not only maintaining consistency, but reminding their audience of who they are. Corporations spend thousands of dollars per year investing in creatives that would greatly improve their business. In terms of design and overall art direction, finding a superlative candidate to join your team can sometimes be more challenging than rewarding. One might end up hiring a designer who does not possess the qualities you assumed they had. 1. They should have a genuine love of design. Although this may seem pretty obvious, this trait can very easily be overlooked. When interviewing a candidate, they will show you the best of his/her works in their portfolio. Granted these works may have been published on their websites, or perhaps smaller side jobs that have been professionally produced. The fact of the matter is–this is expected. A great designer should show works that were produced outside of any financial aspect; personal works they've produced just for the genuine interest of their craft. 2. They should be collaboratively independent. A good designer takes initiative. However, a great designer can take initiative meanwhile working in a team. Working in a team means working with several individuals all with independent thoughts, suggestions, mood swings, etc. Being able to cooperate and take constructive criticism is definitely a MUST for all designers who are considering working in a field involving an outside force. You can test a candidate simply by making a remark about a piece, and observing their reaction (i.e. "Your work is very impressive, do you see yourself making adjustments to <insert portfolio piece> in the near future?"). A great designer would take the suggestion as a grain of salt. 3. They should pay attention to detail. This might seem obvious, but this too–can be overlooked. A great designer should be able to notice when the kerning within a paragraph is not consistent. This may not be something you will see during the interview, but do take note of their cover letter and resume. See if you can recognize some sort of a layout/grid, and make sure their images are of good resolution--this should be apparent within a glance. "...WHAT WE LOOK FOR IN CANDIDATES WE SHOULD ALSO HAVE INSTILLED WITHIN OURSELVES..."
4. They should be organized. Fourth things fourth: You can tell from the very beginning if a designer is organized just by looking at their website/portfolio. How it is organized online should give you a clue as to how organized they are themselves. Ask yourself: Can you pinpoint this artists main interest? Do they have an apparent style through their work? How many tabs are in their navigation? This should all be simple, clean and blatantly obvious. A great designer should also know where their files are stored and ways around a presentation if technical difficulties should arise. Having a back-up PDF, print out or even a folder with JPEGS should be prepped in advance. 5. They should know how to adapt. Lastly, and perhaps the most important quality of a great designer: They must be able to adapt. It is their obligation to keep-up-to date with recent technologies, even if they do not have the financial support to do so (we get it–times are hard). Just knowing that they are aware, makes that much of a difference long-term. If they make references to workshops, campaigns, conferences, blogs, emails and other websites that is a good sign that they maintain an open mind. Now, although this was broken down in terms of design, many of these traits can be applied to any profession. Keep in mind that what we look for in candidates we should also have instilled within ourselves. So regardless if you are the interviewer or interviewee, take these elements into consideration and don't just be good at what you do--be great at what you do. –hopefully you get the idea. I am proud to announce the relaunch of my online portfolio! After many months of deliberation, indecisiveness and all around pandemonium (well, maybe not the pandemonium part), I have finally relaunched this site with a cleaner and more direct interface. The focus in being--to reveal my artistic style through representations of my work. Showcase This page will feature fully conceptualized works. This will range in Creative Direction, Marketing, or UI/UX design. Archive This page will contain all previous works that have been created throughout my artistic career. A majority of these works will be single freelance jobs and/or single purpose media. Contact Pretty much self explanatory. As for my Journal I have decided to take the attention away from blogging, since expressing myself visually is my strong suite. BUT–I may get that itch to write from time to time. When I do, you will be able to locate these posts within the right-hand navigator of my Archive. Or you can simply go to pamgreendesigns.com/journal. I will also have a Shop for selective works throughout my site. You will have to have a keen eye if you're looking to purchase anything you see. This will also be located under pamgreendesigns.com/shop. "My portfolio is my art gallery..."
With all I bid farewell, and encourage you to take a gander, leave comments and share this gallery with spectators alike. Pamela Green is an independent designer currently residing in New York City.